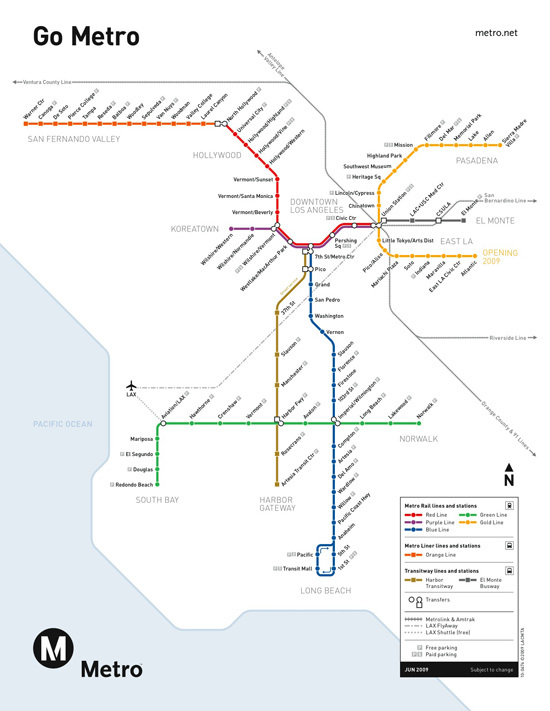 Bet you didn't know: This is the current LA Subway Map. As the LA Times and Curbed LA both reported yesterday, the LA County Metropolitan Transportation Authority (METRO) finally voted yesterday (after several postponements) to approve its Long Range Transportation Plan. The plan outlines how METRO will spend about $300 billion over the next 30 years, focusing on mass transit projects like the Westside subway extension of the Red Line to Santa Monica, for which the county will be seeking substantial federal funding (most of the projects will need support from the feds, although LA County is aided by its new sales tax increase approved last year). Other major initiatives include the Gold Line extension east from Pasadena, a downtown regional connector, the continuation of the Expo Line to Culver City and Santa Monica, and a Green Line extension to LAX. Of course before Angelenos get too excited about all this rail-related news, it’s worth noting that more than 2/3 of the plan is dedicated to highway (widening and surface improvements) and bus-related expenditures (rail makes up about 1/6). And then there’s the timeline: is there one? We haven’t seen it yet… Please help us find it!